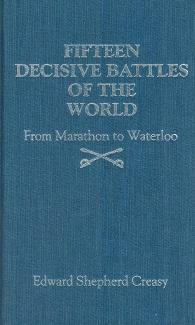 War forms only a part of history, and individual battles even less, but the battles selected by Sir Edward Creasy for this volume have changed the world. Originally published in 1852, this is a classic work if military historiography, both source book and essential guide to the interpretation of world history. Sir Edward Shepherd Creasy was the priemier military historian of 19th Century Great Britain.